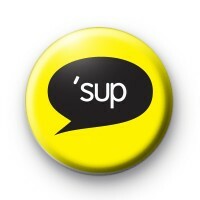 Sup Pin badge in yellow with a black speech bubble and the word 'sup written in a white font. Short for What's Up, this slang badge is perfect for those of you who remember the wassup craze a few years back and want a bit of nostalgia. A really simple badge design inspired by comic book art. We have a great range of slogan badges, funny badges, text badges & offensive badges on the website so be sure to have a browse through the categories or use the search box. All of our badges are made in our family workshop & we have customers all over the world. We offer free delivery on larger orders & even a next day delivery option within the UK for those last minute badge orders.